HABIT: Gray, wooly leafed perennial with tiers of bright yellows in late spring through early summer. Candelabra appearance. Grows to 2' - 3’ in height. 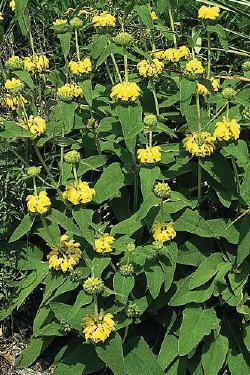 P. russelliana, also called Jerusalem sage, looks similar but is bigger in every way - flowers are larger, dull green leaves are considerably larger getting 3' - 4’ in height. CULTURE: Both forms are drought tolerate and easy to grow in well drained soil. USES: Late spring, early summer color, for perennial gardens and borders.